Handshake is a wholesale sales order management tool that allows your team to write and receive orders using the iPad, iPhone, and Web. This platform is used by sales reps and teams all around the world selling business-to-business (B2B) products and services to present their catalog, handle their customers, and comprehensively streamline their order fulfillment process. Handshake is leading provider of sales order management solutions for wholesale, providing tools such as mobile applications for your sales team in the field as well as B2B operations. It allows for wholesale businesses to offer clients with better engagement and experience, maximize customer data to boost sales, accelerate order fulfillment processes, and help teams efficiently perform sales processes. With Handshake, you can write and receive orders all over the world with just your iPad, iPhone, and the web. No need to manually input sales management information from catalogs, line sheets, faxes, and phone calls. You do not need to write another order by hand. 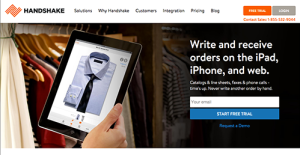 Writing orders on your iPad & iPhone means there is no need to create paper order forms, no more human errors or typos, and no more need to reenter orders. The tool has processed over $1 billion in orders across 47 countries. A fully electronic solution, Handshake reduces your overhead costs and allows your sales staff to focus on the more important tasks of the day than manual order entry. Orders written on this tool by your sales reps immediately sync to the company’s back office, thus speeding up fulfillment as well as time to payment. Handshake delivers outstanding sales order automation that can benefit your customers, sales, as well as operations teams. Each company is different, and might call for a specific Accounting Software solution that will be designed for their business size, type of clients and staff and even specific niche they deal with. You should not count on locating a perfect services that will be suitable for each business regardless of their history is. It may be a good idea to read a few Handshake reviews first and even then you should remember what the solution is supposed to do for your company and your workers. Do you require a simple and intuitive solution with just essential features? Will you really make use of the advanced functionalities needed by pros and large enterprises? Are there any specific features that are especially useful for the industry you work in? If you ask yourself these questions it will be much easier to locate a reliable service that will fit your budget. How Much Does Handshake Cost? We realize that when you make a decision to buy Accounting Software it’s important not only to see how experts evaluate it in their reviews, but also to find out if the real people and companies that buy it are actually satisfied with the product. That’s why we’ve created our behavior-based Customer Satisfaction Algorithm™ that gathers customer reviews, comments and Handshake reviews across a wide range of social media sites. The data is then presented in an easy to digest form showing how many people had positive and negative experience with Handshake. With that information at hand you should be equipped to make an informed buying decision that you won’t regret. An order platform that's handy to have. A staff review in career services. A near-perfect solution for those in sales. What are Handshake pricing details? What integrations are available for Handshake? Pros: The tool is very simple to utilize. This fares way better than the system used in the university. User-friendly. It makes things so much easier for the long term. Cons: At the moment, nothing. I'm still trying to familiarize with this tool's offerings. Pros: Handshake has made the order process easier by digitally searching for products instead of thumbing through a pricelist with over 900 products included. Cons: It has been difficult to initiate the process using the information entered by OXO for our international partners. Handshake has made the order process easier by digitally searching for products instead of thumbing through a pricelist with over 900 products included. It's easy to use. UI is very user-friendly. The possibilities to using it is endless. It lets you have the entire inventory at the palm of your hand. The tool is very simple to utilize. This fares way better than the system used in the university. User-friendly. It makes things so much easier for the long term. Handshake offers convenience for our sales reps at trade shows. Handshake offers an easy to use interface for its users and provides access to the whole inventory. I like how I'm fully utilizing handshake in reaching out to the audience! The platform is really user-friendly. An engaging tool for people to use. We can easily build from it to easily meet our needs. Good stuff! If you need more information about Handshake or you simply have a question let us know what you need and we’ll forward your request directly to the vendor.